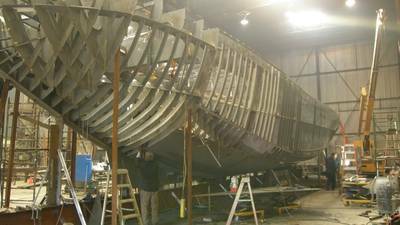 The Iron Guppy, a new custom 20 metre (65') ice breaking tug designed by Robert Allan Ltd of Vancouver is taking shape at Hike Metal Products Ltd in Wheatley, Ontario. The tug is under construction for Ports Toronto and will replace the 1961 vintage William Rest which has served the port well for many years. Iron Guppy was named by Waterfront Elementary School students from a longlist of names developed by students from kindergarten up to Grade 6. The new tug carries over some of the old tug's characteristics such as size, power, and single fixed pitch propeller that the crew have become accustomed to. With a special ice breaking bow it will be able to break at least 6 inches of ice continuously and up to 10" ramming.It will be powered by a single 750 hp Cummins QSK19-M engine turning a 53" five-bladed propeller.Bollard pull will be 6 tons.It is arranged for a crew of up to 6 persons and is fitted out as a "day boat" with a large crew lounge and pantry but no overnight accommodations.The wheelhouse will have excellent visibility all around including to the quick release towing hook on the aft deck. Delivery is expected sometime in June, 2016.